Boosted the increase to movement speed while swimming, and decreased time required to reach maximum swim speed. Decreased ink consumption by roughly 14%. Shots now ink a larger area when they land. Increased minimum damage from 26.0 to 30.0. Increased radius of ink coverage around your feet while firing by roughly 6%. The Main Power Up gear ability will now be more likely to provide its benefit even with fewer instances of the ability equipped. Increased minimum damage from 31.0 to 35.0. Decreased time before ink recovery starts after pressing ZR to shoot by roughly 5/60 of a second. Adjusted the rate of damage drop-off over distance to be less severe than it was previously. 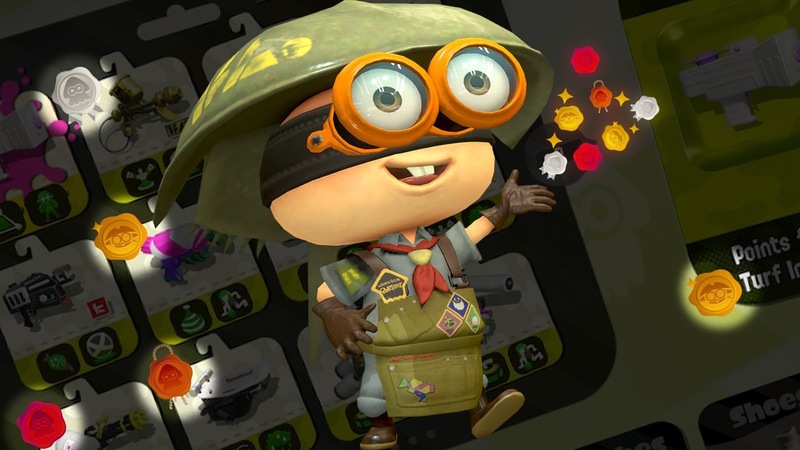 In addition to its other benefits, equipping the gear ability Main Power Up will now also improve inking ability while holding down ZR to ink continuously while moving. Increased damage dealt to the umbrella portion of opponent Splat Brellas, Sorella Brellas, and Hero Brella Replicas by roughly 17%. Increased damage dealt to the umbrella portion of opponent Tenta Brellas, Tenta Sorella Brellas, Undercover Brellas, Undercover Sorella Brellas, and Kensa Undercover Brellas by roughly 20%. Increased damage dealt to Bubble Blower bubbles by roughly 23%. Increased damage dealt to the armor surrounding an opponent using a Booyah Bomb by roughly 4%. Increased damage dealt to opponent Splash Walls by roughly 10%. Increased movement speed while charging by roughly 3%. Increased movement speed while firing by roughly 6%. Increased radius of ink coverage around your feet while firing by roughly 7%. Decreased the benefits of the Main Power Up gear ability. Changed the amount of gear ability required to reach 49.9 damage from 3.1 to 3.9 times the base gear ability. Each additional gear ability is worth 0.3 the amount of the base gear ability. Decreased time before ink recovery starts after ink is used by between roughly 5/60 to 15/60 of a second, depending on how long the R button is held down. Decreased time before ink recovery when R is pressed and released immediately by roughly 5/60 of a second. Decreased time before ink recovery when R is held down continuously by roughly 15/60 of a second. Increased initial speed of bombs by roughly 18% and also increased the distance they travel when R is pressed and released immediately. There is no change to the distance the bombs travel when R is held down continuously. Increased radius of ink coverage when Bubble Blower bubbles hit the ground by roughly 8%. Decreased the interval between bubble shots when in kid form by roughly 5/60 of a second. The Special Power Up gear ability will now be more likely to provide its benefit even with fewer instances of the ability equipped. Silhouettes of players highlighted by effects such as Thermal Ink will now disappear once targeted by the Sting Ray when firing. Improved the gear ability’s benefit of maintaining your ability to jump while stepping in enemy ink. Improved the gear ability’s benefit of maintaining movement speed while walking through enemy ink. Increased duration of Haunt when its requirements are met to last until the end of the match (it previously lasted for 30 seconds). The effects of Haunt on a player targeted by it will still end if that player is splatted. Changed the number of players that can be targeted by Haunt to four. Due to the above changes, the effects of Haunt on a targeted player will continue even after the player that targeted them with the ability is splatted by an opponent. Fixed an issue on Ancho-V Games causing players who switched back and forth between forms near the sponge in front of the Spawn Point to occasionally clip inside the stage terrain. Fixed an issue in certain modes on Goby Arena allowing players to gain access to the raised platform in the opposing base via the grating in front of the opposing Spawn Point. Fixed an issue while using the Goo Tuber or Custom Goo Tuber, in which the white area in the player’s ink tank indicating ink consumption would decrease gradually as the player switched back and forth between forms while storing a charged shot. Fixed an issue making a Torpedo seem to disappear when viewed by the player who launched it if the Torpedo was destroyed just prior to hitting an opponent it was targeting. Fixed an issue causing a Booyah Bomb lost by being thrown into the water or out of bounds not to count toward the number of times a player used their special weapon during a match. Fixed an issue causing the Ultra Stamp to pass through certain objects such as the umbrella portion of a Splat Brella or a Splash Wall when thrown, despite the targeting guide indicating that the object would be hit while aiming. Fixed an issue causing players to jump higher than intended when jumping off a sponge at the instant it expanded in size. Added “Weapon Badges” to the Equip screen and player profiles that will appear for each weapon, to indicate reaching certain turf inked benchmarks.